Indians really are the masters of both spice and vegetables, resulting in the most mouth-watering vegetarian food. There is a common misconception that Indian food isn’t very healthy and overly indulgent because of its’ rich, saucy, and sometimes creamy base. However, Indian food is jam-packed with whole ingredients such as spices, herbs, vegetables, and lentils. My recipe for Coconut Palak Gobi is just that. It’s flavorful comfort food that is nourishing because it’s packed with cauliflower (gobi) and spinach (palak). 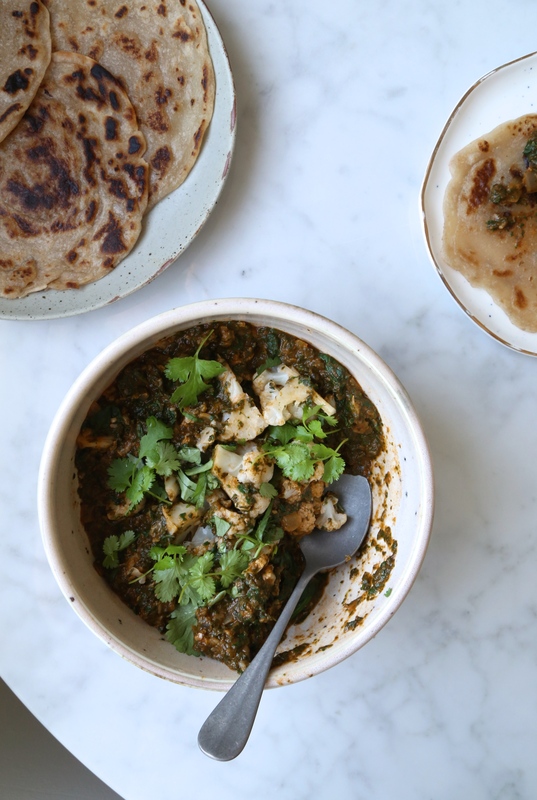 If you choose not to make the palak gobi, it would be a shame to not at least make the ‘Two Ingredient Naan’. It’s so quick and easy to make, you only need 6 minutes tops to put it together. It pairs perfectly with the Coconut Palak Gobi, but it’s also very versatile, you can top it with avocados, nut butters, or whatever you fancy. It’s soft, chewy, and perfectly greasy from the coconut milk. You can store in the fridge for a couple of days but be sure to reheat on a skillet to revive its delicious texture. The naan is made with the new ‘it’ ingredient; cassava flour. Cassava flour is popular amongst health enthusiast because it’s nut-free, gluten-free, and grain-free, making it a suitable option for just about anyone. It’s also composed entirely of the root vegetable, cassava, making it a whole food with the benefit of fibre. This would differ from tapioca flour, which is made from only the starch of cassava. Cassava flour actually tastes like wheat flour, making it the best paleo substitute out there. I’ve read that Otto’s Naturals cassava flour is the only type worth buying at this time, and it’s the only kind I have experimented with, so I do recommenced sticking to this brand. I found it at Whole Foods but you can also purchase it here. Recipe updated: January 11, 2018. It will appear more green than photograph. In a small bowl whisk together coconut milk, cassava flour, and salt. Pour 1/4 cup of batter into a skillet over medium high heat. Spread batter into a thin circle about 5 inches wide with a spoon or spatula. Cook for 2 minutes, flip and cook for an additional 2 minutes, or until lightly golden on each side. Recipe makes 4 naans. In a large heavy bottom pot of salted water add the cauliflower. bring to a boil and cook until tender, about 5 minutes. Drain cauliflower and set aside. In the same pot, add the spinach, and a tablespoon or so of water. Cook over medium heat until spinach is wilted, about 3 minutes. You may need to stir until all spinach is wilted. Drain and rinse with cold water. Squeeze out excess water and place in a blender or food processor with the chili and set aside. Clean the pot for the next step. Melt the coconut oil over medium heat. Add the fenugreek seeds and cook for 30 seconds. Add the onions and salt to taste and cook until starting to golden, about 5 minutes. Add the cumin seeds, garam masala, dried coriander, garlic, and ginger, fry for a minute longer. Add the tomato puree and cook for 5 minutes or until liquid from tomatoes have begun to evaporate. Add mixture to the blender with spinach and puree until smooth. Place back into the pot along with cauliflower. Cook for 3 minutes, stirring often. Cauliflower should fall apart. Remove from heat and mix in the coconut yogurt. Season with salt to taste. Garnish dish with cilantro and serve hot with naan! This entry was posted in Main Dishes and tagged indian, naan, plantfood, spices, Vegan, Vegetarian. Bookmark the permalink.